There are no snakes or billboards in Hawaii. St. John Auction: We are in desperate need of adult food servers .A volunteer food server saves the Auction $100 per server! We also need high school volunteers from 6-11pm for our Silent and Live Auction support and clean up. Please sign up! 2019 Auction Volunteer Sign Up. Dessert Dash: We have 29 cakes as of this morning, but we need 40. Thank you to those of you who have signed up! You can bake or buy…up to you! Please sign up here: Dessert Sign Up. Thank you Ben Howe, Franco Wambua, and Kristen Capka for volunteering at the North Beach School Auction last Saturday! If you turned in a procurement form, but have not yet turned in the physical item(s) that go with it, please do so by this Friday, March 29th. Thank you. Remember to sell your raffle tickets and return them to the school office or the administration building. Every ticket, sold and unsold, must be returned by no later than April 5th. The drawing for the $2,500 cash prize will be held on the night of the Auction. Thank you for your support of St. John School! Classroom art projects are on display at the Greenwood Library from now through Thursday, April 4th. Your kids worked hard on these projects and they turned out wonderful! Take a few minutes and go check them out. (Note: due to size, shape, and other factors, Ms. Kelley’s 5th Grade “Rock Guitar” and Mrs. Edwards 3rd Grade “Chess/Checkers Board” are not on display). 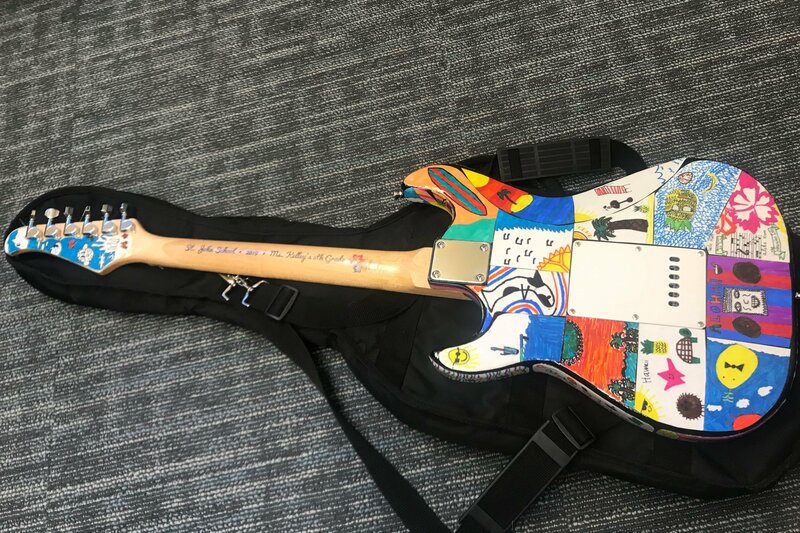 Ms. Kelley’s 5th grade class blended this year’s Auction and school theme to design some inspirational art on the Silvertone electric guitar. Don’t miss your chance to own an original work of art. It’s the perfect gift for the rock star in your family! You and your guests will enjoy a ten-course tasting menu with wine pairing at addo: incubator located in the heart of Ballard. Recently voted “Best Chef of the Year” by the 2018 Eater Awards, Chef Eric Rivera will take you and your friends on a culinary journey catering to any dietary needs, but tailoring an unforgettable food experience for your group. 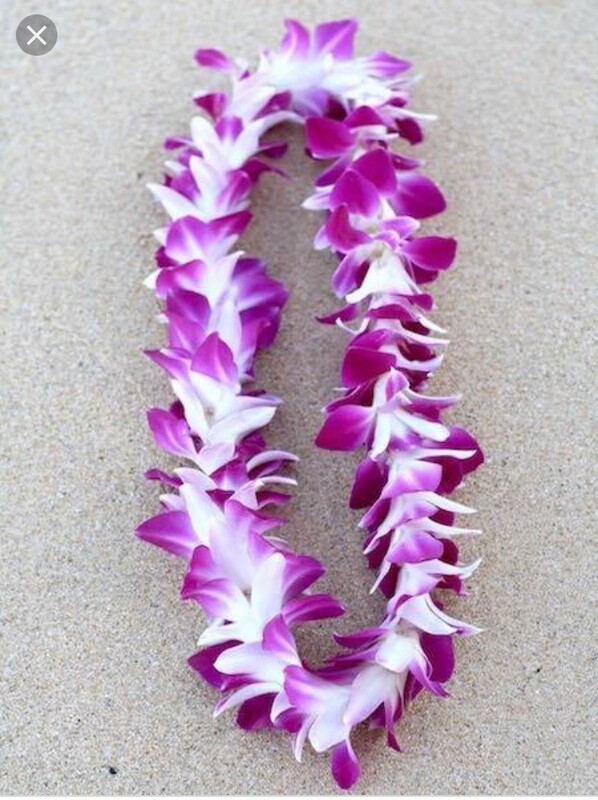 The Auction will be selling a limited number of authentic Hawaiian leis pictured here. Leis may be purchased for $20 each on the night of the Auction. Thank you, Maw Family, for donating! Auction tickets will continue to be available for purchase on-line through Thursday, March 28th. You may buy your tickets by visiting Bidding for Good. Next Next post: It’s Auction Week!